When the New York Times proclaims that San Francisco is about to “drown in millionaires,” people pay attention. A slew of companies - Uber, Lyft, Pinterest, and Airbnb, most notably - are expected to go public sometime this year. This will, in fact, turn thousands of employees into millionaires overnight. The article paints a picture of the inevitable spending that will happen shortly thereafter, mentioning extravagant parties, ice sculptures, electric bicycles - and, of course, real estate. Our take? It's so difficult to truly predict what is really going to have an effect and what is hype. There are a lot of things that factor into market conditions, so it’s really not quite so straightforward and linear. Interestingly, just a couple of months ago there was also a lot of discussion that the housing market is softening or evening out a little. Our educated hypothesis is that many of our "new millionaires" will infuse a burst of energy that will keep our market looking similar to the way it has been for the past few years (low inventory, high demand, aggressive bidding on certain types of properties). Likely, a spike will be most obvious in SF condos. Marin usually feels a ripple effect in events like these, which helps everyone but often visibly favors "rare" properties popular with younger buyers (features like walk to downtown, iconic views, new and sleek construction, etc). In a nutshell, the feeling in the industry is that this new influx may spike SF demand. This could, in turn, help appreciation continue in Marin - but we’re already in an active market and have been for a while now, so it’s a bit like gently tapping the gas while already speeding on the highway. 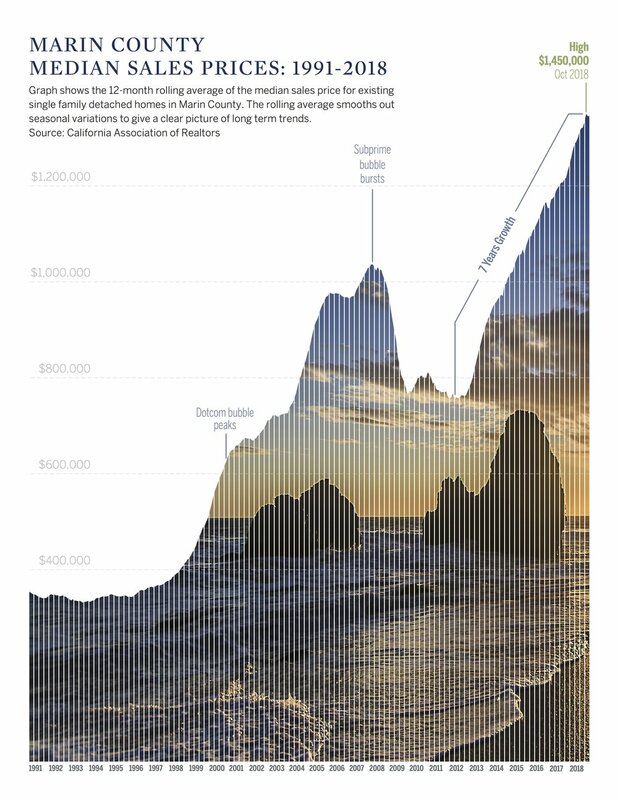 Check out the full New York Times Article here, and visit this post we shared last week to learn more about the history of Marin County’s real estate price appreciation. a look at Marin County’s long-term real estate market and price appreciation. As realtors, most everyone asks us how the market is right now and where it will be next year. Both totally good questions (check out our Marin page here for 2018 market averages by town) and numbers that every potential buyer and current homeowner should be aware of. However, there’s something equally important that a lot of people forget about … long term appreciation. Like the stock market, real estate as an investment is really about the long game - most people hang on to their property for quite a while. Thanks to great schools, super close proximity to SF, lots of protected open space, and geography/zoning laws that have allowed for virtually no new major housing developments - Marin County has performed pretty darn exceptionally, making it through the first dot com bubble nearly unscathed and recovering quickly and strongly from the great recession. Check out the chart above for a summary of the median sales price from 1991 - today.